The Dog Geek: Product Review: Tuggo! 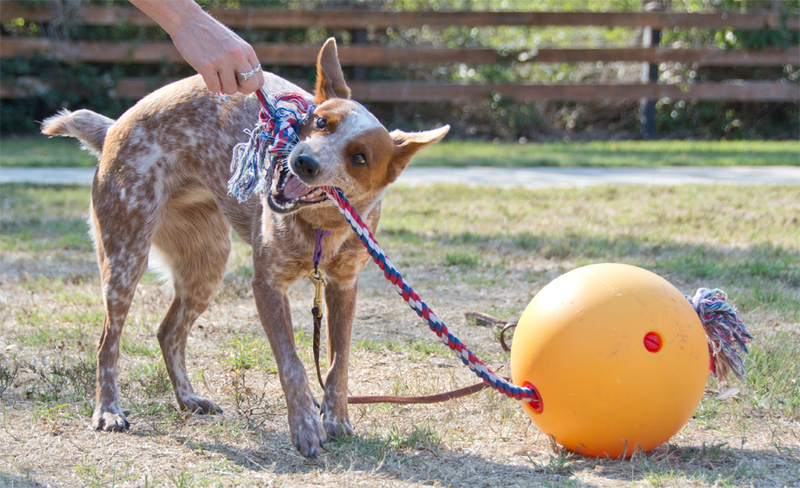 Tuggo is basically the answer to your tug-a-holic dog that can never get enough playtime. It's incredibly durable, can be taken to a park or other open space for playtime, and can be enjoyed by more than one dog at a time. Tuggo is a giant ball made from hard plastic, fill it with water and it provides enough resistance to keep your dog tugging happily while saving your arm. There is a replaceable rope running through the middle of the ball, so a dog can tug it from either end. The larger version is a whopping 10" in diameter, and can be weighted with up to 18 pounds of water. There are also 7" and 4" version for smaller dogs. This was one of the first things I was given at SuperZoo, and I was highly impressed. Look at it! It's so big! Big enough for a huge mastiff to tackle! It's a hard ball too, and most dogs won't be able to get their mouths around it. That's what the rope is for. The rope is threaded through a passage in the center of the ball, so it doesn't get wet and is easy to replace. Tuggo sells a replacement rope, but you can always pick one up at the hardware store too. There are a few different self-tugging dog toys out there. The springpole is a classic, but requires some DIY skills and also something to hang the toy from. I saw a toy at SuperZoo that stakes into the ground and is mounted on a shock-absorbing flexible shaft. The Tuggo is different though, because you can change the weight of the ball by adding or draining water. It is also movable, easy to toss in the car and get out at the park or on a playdate. This is a serious dog toy for serious dogs. It rolls, it makes some noise, and it can actually get quite heavy. 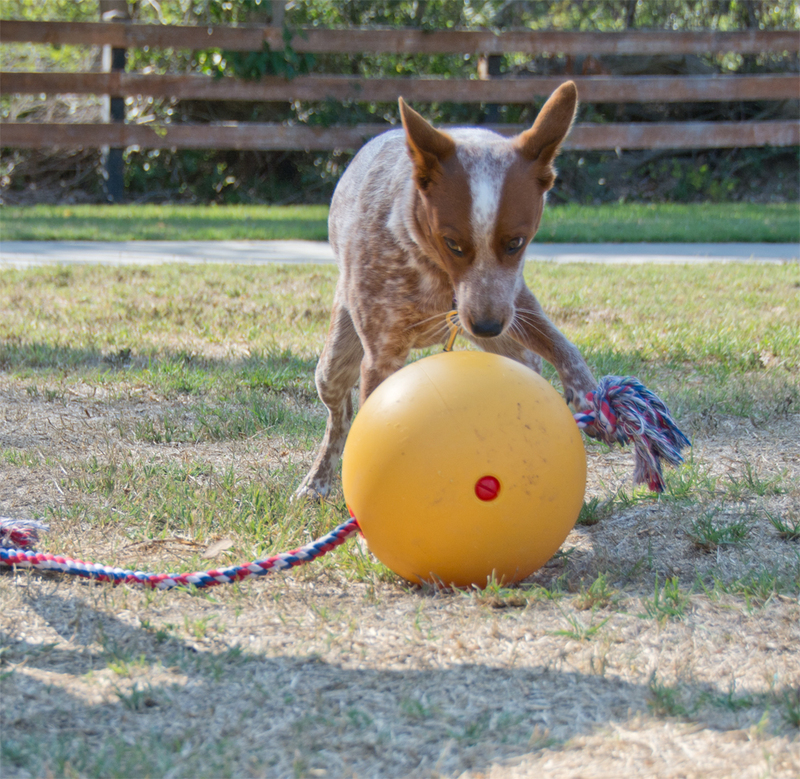 It's precisely the sort of challenge that a lot of terriers and bully breeds enjoy, and the ball rolling around and hitting them just makes the game more exciting. The size and weight of the Tuggo might be a little intimidating for more sensitive dogs, though. Pros: Extremely durable and tough. Weight can be changed. Extremely attractive for certain dogs, maybe even a little addictive. Builds muscle and can really tire a dog out. Allows tugging play without human interaction. Cons: Plastic can crack in very cold weather. Rope is easy to chew through if your dog has a desire for destruction. Definitely an outdoor-only toy unless you don't really care about your floors/walls/furniture. May be intimidating for some dogs. Bottom Line: This is a fabulous toy for a certain type of dog. It's a great way to let a pit bull, jack russell, or other drivey physical dog go hard at something for as long as they like. Ideally they wouldn't even need human interaction, you just point them at it and get out of the way. That said, the Tuggo taught me that my superintelligent herding dogs are primarily interested in tug as a way to interact with me. I had thought they loved it for the sheer joy of tugging, but it turns out they only care if there is a human on the other end of the toy. They also find the huge ball to be intimidating rather than exciting, they get worried when it rolls toward them. It's wonderful for some of my client dogs, though!